The McCormick red velvet cupcakes were a hit with Fuzz’s girl scout troop. Still, I was anxious to try another recipe because while I liked the McCormick red velvet cupcakes, I thought they were too chocolaty to be true red velvet. If you like your red velvet cake really chocolaty, you’ll be happy, but if I want chocolate then I make a chocolate cake. Red velvet should be red. And thus the red velvet cupcake comparison quest continues. Here’s a list of the the red velvet cupcake recipes I’ve tested fairly recently. 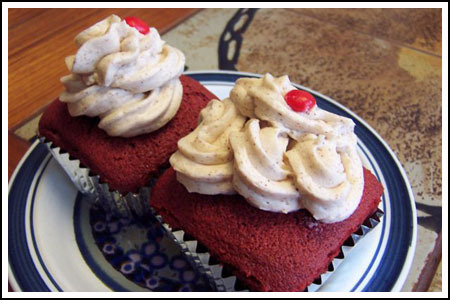 McCormick’s Red Velvet Cupcake Recipe — (Above) Made these as cupcake cones. They’re too much like chocolate cake, but not as good as chocolate cake. Not red enough. If you’re going to go red velvet, you need to go all the way red. Hey There Cupcake! Red Velvet Cake recipe on Epicurious — Great color! Lovely velvety texture. Not enough flavor in my opinion and tasted kind of floury. They weren’t terrible, though – I just thought I could do better. Martha Stewart’s Red Velvet Cupcakes — A little too soft and oily from the cake flour and fat. Didn’t like the structure or texture, but definitely moist and people who go crazy over things that are moist like these. Also, not red enough. Red Velvet Cupcakes from Baked — Louise tested these. She liked them, but I haven’t bothered to try them since they seem to close to chocolate cake. Again, no offense to those who like red velvet cake to be very chocolaty, it’s just not what I’m shooting for. And here’s a link to an old post mentioning red velvet cakes I want to try. Two of those (Paula Deen’s and Simply Recipes) I’ve crossed off because they’re too close to the Hey There Cupcake/Epicurious recipe I tested yesterday. But aside from those I’m still making my way down that list and as of today, have made the Bobby Flay Throwdown Red Velvet Cupcakes. I’ll tell you how those stacked up in a different post. I haven’t tasted them yet. I’m betting Southern Living has an awesome on in their archives…. My mother made me a Waldorf Astoria red cake for my December birthday every year. During her last few years she found Duncan Hines’ Red Velvet cake mix & we didn’t even notice the difference. I prefer the flour/milk buttercream to cream cheese icing. It’s an actual cake recipe, not specifically for cupcakes, not sure if that makes a difference and apparently it’s in her latest, Rose’s Heavenly Cakes. Caroline, I don’t like oily cakes but I DID like the Throwdown cupcakes. They have a lot of oil, but don’t taste too greasy. Cheri, let me know what you think! Jen, that recipe was on my original list and I’ll definitely make it. Katrina, I didn’t know RLB had one. Adam, look around for a recipe called “boiled icing” or “fluffy boiled icing”. It was the original topping for red velvet cake before cream cheese frosting became popular. It looks kind of gross on paper but it’s actually delicious. Sue, I ended up making them Rice Krispie treats and Chocolate Cheesecake Cups. So what did you make for the fourth graders? I’ll look forward to next Red Velvet Cupcake post! I am now considering making Red Velvet Cupcakes this weekend. I have yet to make Red Velvet anything and I suppose that Valentine’s Day would give me an “excuse” (not that I need one :)). However, I have people in my family that do not like cream cheese, given that you mentioned the unique flavour of Red Velvet, what would you suggest as another possible pairing? Back when I made a red velvet bundt cake in Nov. that I didn’t like, my chef friend, Paige told me she likes the Rose Levy Berenbaum one. Just another one to possibly try. I haven’t tried any since Nov. I had to make Red Velvet cupcakes for Christmas. Not to throw another one at you, but I made these and was told not to bother with any other recipe: http://www.joythebaker.com/blog/2009/09/my-favorite-red-velvet-cupcakes/. I’ve been looking for a red velvet cake to send to work on Valentine’s Day. Given the results you posted, I might try the Throwdown cake. Thank you, Anna! Glad you found one you like so far! It’s hard to believe how many ‘variations on a theme’ you can find for any classic – and that each person has their own favorite. Good to know about the Cake man one, I hate oily cakes. I’m thinking I might have to try this throwdown one! Yeah, but I’d rather just have chocolate cake. Red velvet is supposed to have a very distinct flavor and too much cocoa muddies it up. Anyway, the cupcakes from Throwdown nailed it! They’re my favorite so far and I will post the photo shortly. Thanks Caroline! That one does look good. I think I saw a different Paula Deen recipe that didn’t call for cake flour, but I do think cake flour would solve some of the problems in the Epicurious/Hey There Cupcake recipe. It tasted kind of floury. I didn’t care much for Cake Man Raven’s when I tried it. I think I found them too greasy and soft. Martha’s was a little too greasy for me as well. I know that’s a popular one, though. I actually made the Paula Deen recipe from Food Network (http://engineerandanoven.blogspot.com/2011/01/red-velvet-cupcake.html) I liked them, as did those who ate them. If you find yourself hankering for another recipe to try after exhausting the other options, I’d say give this one a try. Her recipe uses cake flour, which I thought really helped the cupcake, the epicurious one uses AP. And Paula’s has more butter, too. Just my little ol’ 2-cents.